SCOOTISSIMO ~ For the Love of Scooters! 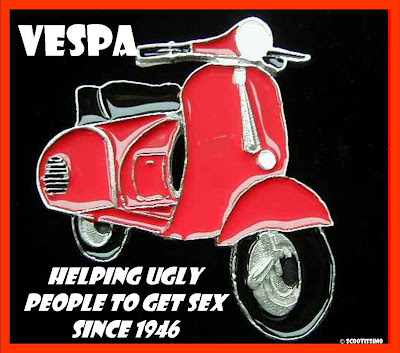 The trials and tribulations of a scooterchick from the bush. 41 degrees, does that mean summer is here? Well, summer is finally here. It's been very very hot down here with days in excess of 40 degrees. Yuk. Real bushfire weather and even unpleasant for scooting. She does love the warm weather though, she's been riding like a dream, starts easily and idles evenly all the time and the ride on the open road is effortless, powerful and seriously more emjoyable than ever before. I have a goofy smile on my face by the time I reach 3rd gear every morning when leaving home. I love that feeling. Although Lola has been running well there are a few things that still need doing and since the rebuild I have been too busy scooting to worry about pulling her apart again but it has to be done so will attempt it this week if not too hot in the shed. Rear hub seals, brakes, fix horn and brake lights, realign front tyre (got a little wobble, think the rubber is on crooked) as well as a few little CDI jobs, add battery to rectifier and rewire rear brake to work in with system in reverse. 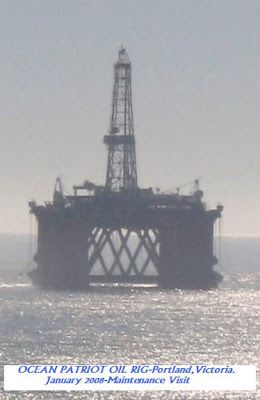 So it's time to head out for a scoot, theres a massive oil rig in our port at the moment which is about 20 storeys tall, an awesome sight indeed.